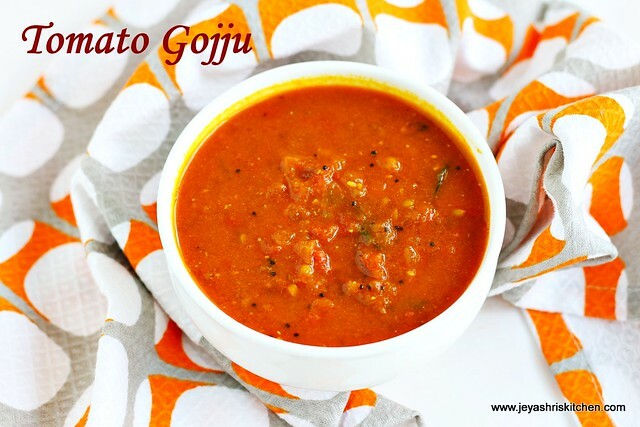 Tomato Gojju is a simple yet tasty recipe and a perfect side dish for idli | dosa | ven pongal. 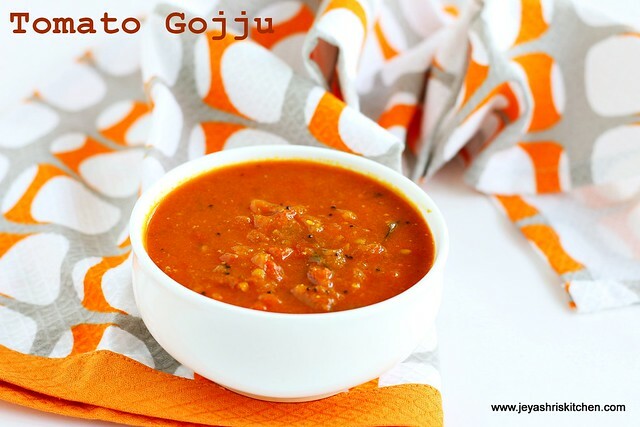 Gojju | gotsu recipe is a typical karnataka recipe which i learnt from my friend some time back. When i was running out of ideas as what side dish to make for Ven pongal, suddenly this idea of making tomato gojju came to my mind. It tasted very yum with pongal. Then later i made it again to make this tomato gojju post. Traditionally it is made with rasam powder, but since i don't have in stock i used home made sambar powder. Check out my collection of side dish for idli |dosa. Finely chop the tomato and green chili . In a pan add the oil and the urad dal, mustard seeds, curry leaves and chopped green chilies. When the mustard splutters and the dal turns golden brown add in the chopped tomato. Add the turmeric powder, sambar powder or rasam powder and salt. Add 1 to 1 and 1/2 cup of water to this and mix well. Allow this to boil for 15 minutes in a low flame till the raw smell of the sambar powder is gone. You can mash the tomatoes nicely when it is cooking. Use the back of the ladle for this. Add the jaggery and roasted methi seed powder . I just dry roasted the methi seeds and pound in the mortar and pestle. You can also use whole seeds while adding the urad dal. Mix well and let this boil for 2 more minutes. Tomato gojju is ready to serve. Serve this with idli| dosa| chapathi| ven pongal and even with rice as a gravy. Methi seeds can be added while tempering too. If adding powder do not add more than the quantity mentioned. Else it will taste bitter. You can cook it for more time and make it as a thokku and take it for travels. This goes well even with toasted bread too. Nice one.i was just thinking. Whether you or raks have posted Paruppu thengai recipe.The cone shape one that is kept in marriages.Although we dont have that tradition my mil does it. So do post if u haven't.